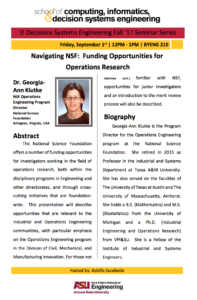 How can the National Science Foundation help you with your industrial and operations engineering research? Adolfo Escobedo hosts Georgia-Ann Klutke from the NSF to talk about research opportunities on Friday, September 1, 2017 as part of the IE Decision Systems Engineering Fall 2017 Seminar Series. The National Science Foundation offers a number of funding opportunities for investigators working in the field of operations research, both within the disciplinary programs in engineering and other directorates, and through cross-cutting initiatives that are foundation-wide. This presentation will describe opportunities that are relevant to the Industrial and Operations Engineering communities with particular emphasis on the Operations Engineering program in the Division of Civil, Mechanical and Manufacturing Innovation. For those not familiar with NSF, the presentation will go over opportunities for junior investigators and an introduction to the merit review process. 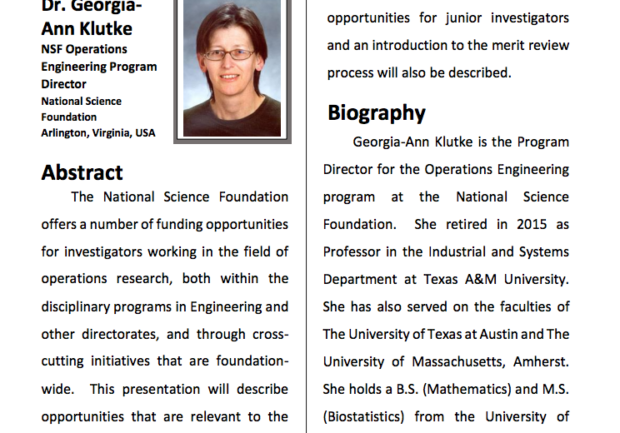 Georgia-Ann Klutke is the program director for the Operations Engineering program at the National Science Foundation. She retired in 2015 as professor in the Industrial and Systems Department at Texas A&M University. She has also served on the faculties of the University of Texas at Austin and the University of Massachusetts, Amherst. She holds a bachelors degree in mathematics and a master’s degree in biostatistics from the University of Michigan and a doctorate in industrial engineering and operations research from the University of Michigan and a doctorate in industrial engineering and operations research from VPI&SU. She is a Fellow of the Institute of Industrial and Systems Engineers.